Customers of Unitil have been outraged since last month’s ice storm plunged thousands of them into darkness for nearly two weeks. Petition drives are being held this afternoon in Lunenburg and Fitchburg seeking the company’s removal and local officials are exploring their long-term options for replacements. One recurring idea is the establishment of a municipal utility. There are 40 municipal utilities already operating in the state, but the last one was formed — in Chester — in 1926, according to David Tuohey, corporate communications director for the Ludlow-based Massachusetts Municipal Wholesale Electric Co. Mr. Tuohey’s agency buys power in bulk and resells it at cost to municipal utilities. “All municipal rates are lower than the investor-owned utilities,” Mr. Tuohey said, chalking up the lower prices to being nonprofit agencies, eligible for tax-exempt financing and able to own pieces of their own power supplies. Investor-owned utilities such as Unitil, meanwhile, had to divest from power generators in the industry-wide deregulation of the 1990s. Many of the current municipal utilities were formed as electric service was first being brought to their communities, Mr. Tuohey said, so the process of forming one today would be much more complicated. There is legislation on the books covering the formation of municipal utilities, but critics say it is vague and weighted toward existing companies, one reason there has been no expansion in their number for decades. “The investor-owned utilities are fortunate the statute was written 100 years ago,” said Patrick Mehr of the Massachusetts Alliance for Municipal Electric Choice. The Lexington resident has championed the formation of a municipal power company in his community for years. The century-old language in the current statute all but gives utilities “a veto right” on municipal power projects, Mr. Mehr said. Mr. Mehr is seeking support for proposed legislation — first introduced in 2005 and scheduled to be refiled this week — that would make it easier for municipalities to take over power infrastructure. Once a fair price for the infrastructure was set, the bill proposes, the utility would have to sell. Any disagreements in values would be decided by the state Department of Public Utilities. Greater competition would benefit customers, he said, and municipal utilities would not offer the multimillion-dollar pay packages awarded to top executives at investor-owned utilities. State Rep. Jay R. Kaufman, D-Lexington, is the chief sponsor of the proposed legislation, known as House Bill 3319. State Rep. Stephen L. DiNatale, D-Fitchburg, is one of Mr. Kaufman’s numerous co-sponsors. The issue is expected to be referred to committee for review. The residents of Massena, N.Y., on the St. Lawrence River, found that out more than 30 years ago. In 1974, residents of that town of about 13,000 people began a campaign to chart their own utility path. The town was home to a major New York Power Authority operation, but saw the low-cost electricity produced there shipped elsewhere and instead paid Niagara Mohawk Power Corp. for its energy. Niagara Mohawk was acquired by National Grid in 2002. A legal battle ensued that lasted seven years. In the end, Andrew McMahon, the superintendent of New York’s Massena Electric Department, was able to purchase the infrastructure from Niagara Mohawk, and the Massena Electric Department turned on the lights in May 1981. The rates dropped immediately, Mr. McMahon said in an interview last week. The municipal utility’s charges remain in the bottom 25 percent of the country. The utility charges a total of 6 cents per kilowatt hour today, he said, while neighboring National Grid towns are charged more than twice as much. 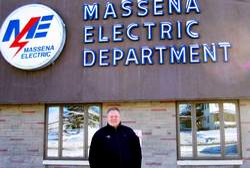 Massena Electric is able to accomplish this because the finances involved with a municipal utility are different from an investor-owned operation such as Unitil or National Grid, Mr. McMahon said. When northern New York was ravaged by an ice storm in 1998, the power was back on in Massena in two days. Parts of neighboring communities served by National Grid were in the dark for three weeks, Mr. McMahon said. He attributes the quick recovery to an aggressive maintenance program still employed by the municipal utility. “We give ourselves the best chance to keep the lights on,” Mr. McMahon said, boasting the department’s customers lose power an average of 40 minutes per year, while the national average is two hours. Fitchburg Mayor Lisa A. Wong said a study was done in 1981 about the feasibility of Fitchburg creating a municipal utility. She said she has not read the study in its entirety, but has learned it concluded there were legislative hurdles that would make it difficult to accomplish. The mayor said seeing better service provided to Fitchburg residents is her immediate goal. “There is somebody who owns the infrastructure and there is somebody who should be held responsible,” she said. As for undertaking a municipal utility project, the mayor said much more investigation was needed. Fitchburg City Councilor Dean A. Tran is pushing for such an investigation. Mr. Tran wants the mayor to convene a committee to look into forming a municipal utility for the city. Unitil Senior Vice President George R. Gantz said he understands the public frustration and the difficulties the prolonged outages created. Mr. Gantz said he knows that some of the communities in Unitil’s service area are exploring municipal utility options. He said the company had not seen the proposed legislation that would ease the process for creating new municipal utilities. Contact Matthew Bruun by e-mail at mbruun@telegram.com.